From my cousin Denise in Idaho. I appreciate her concern for America. I also value Navy Veterans for their spot on advice at this troubling time in America’s history. Perhaps the government should listen to the pearls of wisdom that emanate from those who have been there. 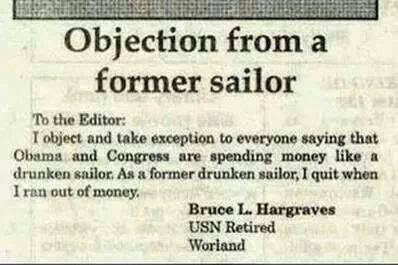 Obviously, this statement unfairly tarred and feathered numerous former drunken sailors of all stripes. Frankly, I’m amazed that more have not voiced a similar dissent. Considering we could probably reduce the world production of whiskey simply by reducing the numbers of the standing US Naval forces, this is sage advice indeed. This entry was posted in FACE HUMOR and tagged ASKNOD BOOK, asknod.org, asknod@wordpress.com, Gulf War Vets Help, Korean War Vets Help, Veterans claims help, Vietnam Veterans Claims Help.. Bookmark the permalink.